Ever since I was young, I've had a thing for Ancient Greek mythology. I had a book on all the Gods and Goddesses and Hercules was one of my favorite Disney movies (still is.) As I've gotten older, I've forgotten most of what I'd learned, it may be time for a refresher...if I could only find that book! But now, thanks to Ancient Greek Sandals, I can show my love with clothes...shoes specifically! And we all know how much I love unique shoes! Even though a lot of straps look cool, they are hard to wear! I finally decided on the Ikaria sandal which took me a while because I couldn't pick a color (see this Instagram.) I went with natural because it would match everything - see all the available colors at the Ancient Greek Sandals website. I was so excited when they finally arrived, the leather is SUPER soft and comfortable and I can see myself wearing these for years to come. I imagine they'll only get better as they age. Before I get to photos of my new favorite sandals, enjoy some information on the company, founded in 2011, courtesy of their about page: According to an ancient greek myth, the gods and goddesses had their sandals made on the beautiful island of Crete by a gifted sandal maker who enriched each pair with magical powers. Famous for having made the flying sandals for Hermes, the sandal maker also embellished them with his personal signature... a ‘golden wing’ buckle. The first styles have come to light and we are reproducing them for you, handmade in beautiful natural leather that ages beautifully with time and wear. We don’t however include the magical powers; you can enrich them with your own! Enough chattering, time for the photos! All the sandals are hand-made to order in Greece when you place an order directly from their website. Because of this it takes 14-30 days for them to arrive. So if you like a pair on the website and don't want to wait that long just do a quick search to see if they are available at any other retailers. Below are some more I would love to add to my closet. Now my problem will be to not buy every single pair. This is NOT a sponsored post, I wrote it because I like the company. I love greek sandals!Maybe I'm from Greece and I cant be objective but they are beautiful! 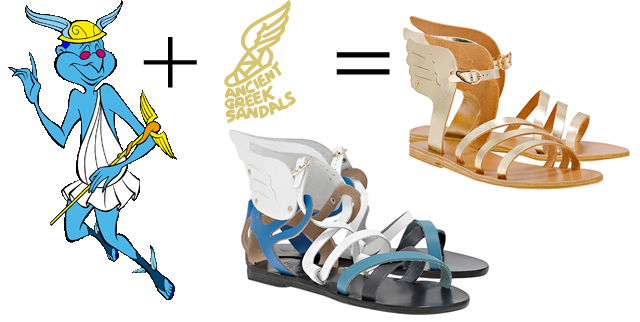 I love those sandals...and I am also a huge Greek mythology nut. Those sandals are so fun! I like a ton of their other options too. I think the Althea are my favorites! When I first saw these shoes I also thought of Greek Gods!!! LOVE them, they are so cute. Ohhhh handmade in Greece - that makes them even better! Of course they are already awesome, I mean, they have wings on them after all! Hi! Wow I adore!!!! So great!!!!! !